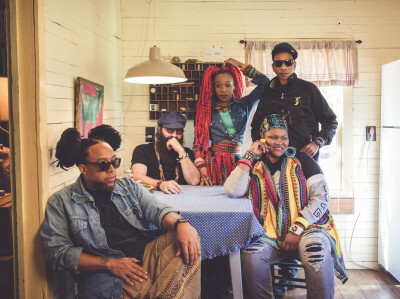 Arrested Development (AD) are true trailblazers within hip-hop music. Since 1991 they’ve championed colourful sounds, while spreading a unique mixture of consciousness and musicality around the globe. They’ve been recognised as one of the greatest hip-hop artists of all time by VH-1 and won 2 MTV Awards (1993). If that wasn’t enough, their song “Tennessee” was voted one of the 500 Songs That Shaped Rock and Roll by the Rock and Roll Hall of Fame! AD’s hit song “Mr. Wendal” brought much needed attention to the plight of the homeless and the group gave half of that singles royalties to the National Coalition of the Homeless. Their dance smash, “People Everyday” (Metamorphosis mix) addresses the tension between ignorance & consciousness, while paying homage to Sly & the Family Stone. MTV’s Buzz Clip was the first major video outlet to play their music video, for their track “Tennessee”, which exposed them to the broader world. Spin Magazine, New York Times, and the LA Times amongst many other juggernauts featured AD on their covers. Later, the group would also become recipients of the NAACP image award (1993) plus a Soul Train music award. Arrested Development was the first ever in rap music to have an elder (Baba Oje) who brought wisdom to the youthful energy of the group. AD was the 2nd ever in hip-hop to tour with a live band, to have female and male members, plus boast a message of hope, change and celebrating life. They were poised to change the direction of rap forever, but that would not end up happening. Some theorise that major labels and other powers sabotaged the groups success to keep the masses from activism and consciousness. Others note the groups inner turmoil as the culprit. Either way, the collective took a hiatus between 1995 and 2000. Since 2000, they’ve released numerous albums primarily overseas and each garnered the group top ten hits in Asia or major tours throughout the world.